Ever wondered what Ed Begley Jr. tasted like? You’re creepy, stop. For those who answered the question with a resounding “no” I’ll continue on. Ed Begley Jr. and man named Bill Sabo created a line of all natural sugar free sodas. Ok, so I’m pretty sure Bill Sabo did the creating, but Ed Begley’s name is on the bottle as well...unless you go to the website where it’s called Birdie and Bill’s. I have no idea why, but we’re going to ignore that fact to avoid potential awkwardness (maybe it was a love triangle?! Gasp!). The first flavor I’ve chosen to review is Cream Soda. The ingredients tell me that it’s sweetened with SweetenFX which is their proprietary blend of stevia (duh) and Erythritol. Faux Fact: E.B.J tastes like Twist. Now since SweetenFX is strictly a Begley’s and Bills item I’ve never come across it. The bottle swears to me this soda is “Great Tasting” in both English and French, so who am I to doubt it. Oh, I’m a guy that hasn’t had a good stevia sweetened “brown” soda. That’s who I am, so I will doubt it. Let’s not give me much time to doubt though. It’s time to dive in. My nostril pulls sharply at the mouth of the bottle, just barely getting the scent of cream soda. What I do smell is pleasant. There is a very strong vanilla presence in terms of aroma which is something I fully expect of any cream soda. I do hope that this scent translates honestly into a taste. Alright Ed, or Bill, or Birdie, you’ve got a pretty decent cream soda here. SweetenFX really does an excellent job of creating a drinking experience that lacks the terrible aftertaste stevia is associated with. Can I tell this isn’t made with sugar? Yes, but I don’t care all that much as the chemical taste is minimal to non existent at times. Instead a rich vanilla taste lingers with each sip. The carbonation is light, but noticeable enough to contrast the smooth cream soda mouth feel you’d expect. What’s most impressive is that cream soda is a known sweet beverage and they replicated it very well. You pick one up and expect a sugar rush in the taste. They've managed to mostly duplicate that sensation with no sugar at all. It was a risky soda to make, but they've pulled it off beautifully. 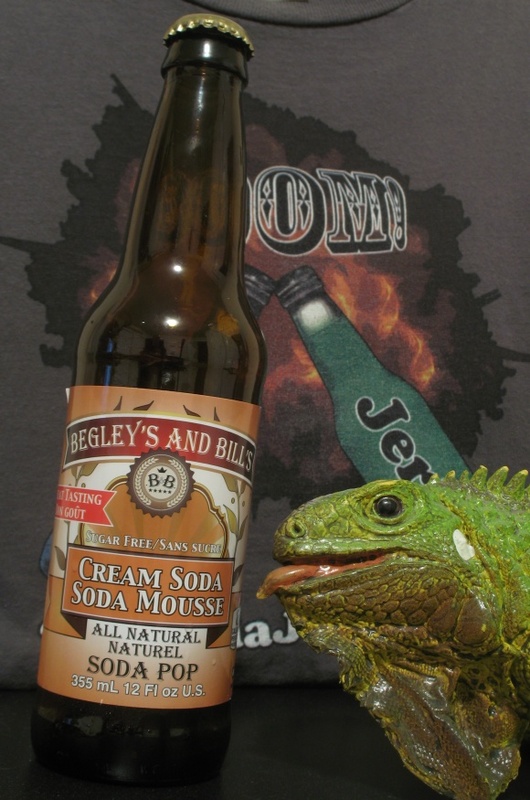 So, does Begley’s and Bill’s Cream Soda match up to the big brand cream sodas? Yes it really does and while the flavor isn’t something I’m going crazy over it’s still a good solid cream soda. For those who need a sugar free cream soda I want to steer all of you in the direction of this bottle. For those of us who are fortunate enough to be able to chose between sugar full and sugar free, I still suggest you buy a pack. Either way I’m looking forward to trying a few other bottles of Begley’s/Birdie’s and Bill’s.